We currently have full translation capabilities for Arabic, Catalan, Croatian,Danish, Dutch, Finnish, French, German, Hebrew, Hungarian, Italian, Japanese, Korean, Norwegian, Polish, Portuguese, Russian, Slovak, Spanish, and Swedish. 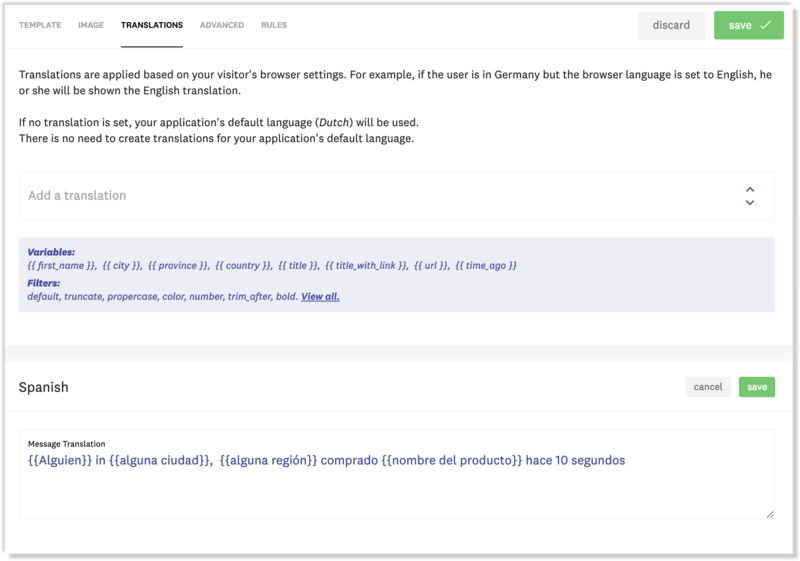 Once configured, the translations are then displayed to end users based on their default language set in their browser. We can add new translations if you don't see your desired language in our current options, and if you are using RTL scripts please let us know, as this can also be enabled through a quick CSS modification. Enable the feature as shown above, and then hit 'Save'. Now you can head over to your templates for the last step. You can access your templates by clicking into the integration tab, clicking on an enabled integration, and scrolling down to see the associated templates. Once you've selected your desired template, click into the 'translations' tab. Now you can configure your translations (it's possible to configure multiple translations per template) and then hit 'Save'. If you have any questions or would like some help, please reach out to us via live chat or through our support email hello@fomo.com.